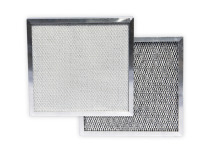 The 4-PRO Filter ensures proper dehumidifier operation and protects occupants and workers in four ways: 1) cellulose mesh captures larger particles; 2) electrostatic polypropylene captures smaller particles; 3) activated carbon absorbs odors and fumes; and 4) antimicrobial treatment helps prevent bacterial growth on the filter. To keep your dehumidifiers operating at maximum efficiency and to maintain the dehumidifier warranty, only 4-PRO filters should be used in Dri-Eaz dehumidifiers. These filters are designed specifically by Legend Brands for use in Dri-Eaz dehumidifiers for restoration, remediation and construction applications. Other filters will not adequately protect your dehumidifier nor provide adequate airflow for proper dehumidifier operation. Important: 4-PRO filters are NOT reusable and should be replaced according to these guidelines. Do not attempt to clean and reuse 4-PRO filters, as this will eliminate the filter's electrostatic charge and may cause damage to your dehumidifier. Minimum filter change intervals depend on the type and amount of particulates present in the air. Always check the filter after every use, and change whenever the accumulation of dust and debris is visible. Includes standard water damage remediation jobs and humidity control in occupied spaces. Change the filter whenever the accumulation of dust and debris is visible. Includes areas with higher particulate loads, such as construction sites or crawlspaces. Change the filter after every job or whenever the accumulation of dust and debris is visible. Includes areas with contaminants that present a health risk, such as sewage losses. To reduce the possibility of cross-contamination, filters should be replaced after every job or whenever the accumulation of dust and debris is visible. Note: According to industry standards, to prevent aerosolizing contaminants, drying in contaminated environments should begin only after removal of affected structural materials and a thorough cleaning of affected area has been completed. Do not use Dri-Eaz dehumidifiers in locations where demolition, wallboard installation, sanding or painting is occurring. Do not use Dri-Eaz dehumidifiers where mold is present.